In general terms, an event is something special that is going to happen. For example, Microsoft launches events for developers, to make them aware about the features of new or existing products. Microsoft notifies the developers about the event by email or other advertisement options. So in this case, Microsoft is a publisher who launches (raises) an event and notifies the developers about it and developers are the subscribers of the event and attend (handle) the event. Events in C# follow a similar concept. An event has a publisher, subscriber, notification and a handler. Generally, UI controls use events extensively. For example, the button control in a Windows form has multiple events such as click, mouseover, etc. A custom class can also have an event to notify other subscriber classes about something that has happened or is going to happen. Let's see how you can define an event and notify other classes that have event handlers. 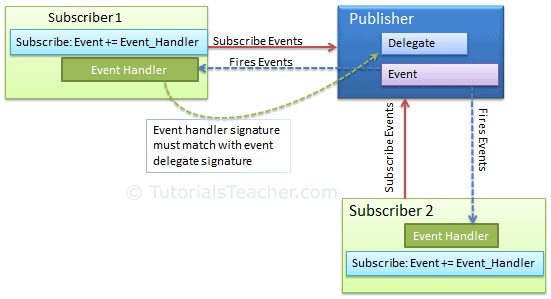 Thus, a delegate becomes an event using the event keyword. Now, let's see a practical example of an event. Consider the following PrintHelper class that prints integers in different formats like number, money, decimal, temperature and hexadecimal. It includes a beforePrintEvent to notify the subscriber of the BeforePrint event before it going to print the number. The delegate can also be invoked using the Invoke() method, e.g., beforePrintEvent.Invoke(). PrintHelper is a publisher class that publishes the beforePrint event. Notice that in each print method, it first checks to see if beforePrintEvent is not null and then it calls beforePrintEvent(). beforePrintEvent is an object of type BeforPrint delegate, so it would be null if no class is subscribed to the event and that is why it is necessary to check for null before calling a delegate. Now, let's create a subscriber. Consider the following simple Number class for example. All the subscribers must provided a handler function, which is going to be called when a publisher raises an event. In the above example, the Number class creates an instance of PrintHelper and subscribes to the beforePrintEvent with the "+=" operator and gives the name of the function which will handle the event (it will be get called when publish fires an event). printHelper_beforePrintEvent is the event handler that has the same signature as the BeforePrint delegate in the PrintHelper class. Events can also pass data as an argument to their subscribed handler. An event passes arguments to the handler as per the delegate signature. In the following example, PrintHelper declares the BeforePrint delegate that accepts a string argument. So now, you can pass a string when you raise an event from PrintNumber or any other Print method. Now, the subscriber class should have an event handler that has a string parameter. In the following example, Number class has a printHelper_beforePrintEvent function with string parameter. Use event keyword with delegate type to declare an event. Check event is null or not before raising an event. Subscribe to events using "+=" operator. Unsubscribe it using "-=" operator. Function that handles the event is called event handler. Event handler must have same signature as declared by event delegate. Events can have arguments which will be passed to handler function. Events can also be declared static, virtual, sealed and abstract. An Interface can include event as a member. The .NET framework uses an EventHandler delegate and an EventArgs base class.